Home BRIDE FOR RENT FOUR SISTERS AND A WEDDING KIM CHIU MOVIES NO OTHER WOMAN PRAYBEYT BENJAMIN STAR CINEMA SUDDENLY IT'S MAGIC THE MISTRESS THIS GUY'S IN LOVE WITH U MARE TRAILERS VIDEOS XIAN LIM YOUTUBE Kim Chiu-Xian Lim's new movie 'Bride For Rent' - trailer draws 1 million Youtube views in 5 days! 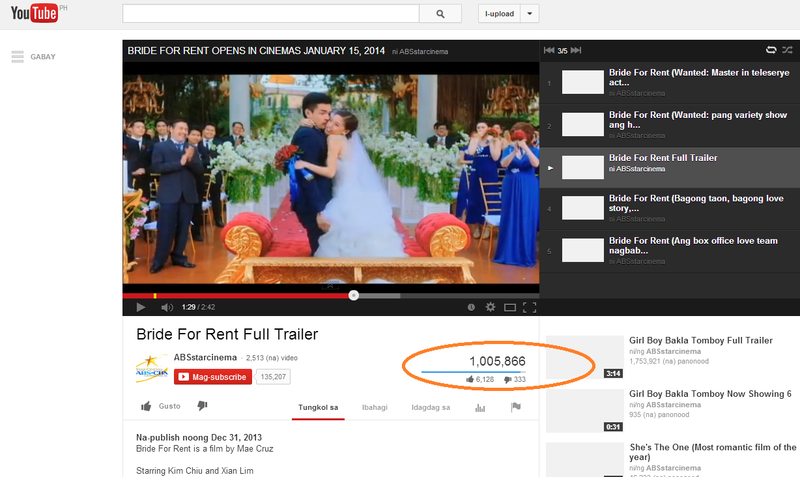 Kim Chiu-Xian Lim's new movie 'Bride For Rent' - trailer draws 1 million Youtube views in 5 days! Kim Chiu and Xian Lim's newest movie "Bride For Rent" is yet to hit theaters starting January 15, 2014, but this early, KimXi fans already have a reason to celebrate: the movie's full trailer already has over 1 million views on Youtube. The "Bride for Rent" full trailer was uploaded on Star Cinema's Youtube channel (ABSstarcinema) just last New Year's Day (January 1, 2014), in less than 5 days, it already crossed 1 million Youtube views. I was able to catch that one big moment when "Bride For Rent" trailer hit 1 million at 2:15 AM on Monday, January 6, 2014, as shown in the Youtube screenshot below. Didn't catch the exact 1,000,000 count, but I was monitoring the views from the moment it was nearing the 1-million mark, constantly refreshing the page until I saw the views finally hitting over 1 million. 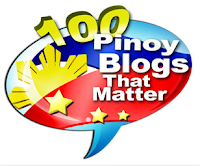 As of latest count, 4:04 AM of January 6, it already has 1,019,888 views. This could be a sign that "Bride for Rent" will be a mega hit, just like their first movie teamup "Bakit Hindi Ka Crush Ng Crush Mo? ", whose trailer also drew 1 million views more than a week after it was first uploaded in the same Youtube channel. The trailer of the film that ultimately earned P102.4-million in the box office currently has over 1.5 million hits in Youtube. Among Star Cinema films, is the "Bride For Rent" trailer the fastest to reach 1 million? I think so. And if it continues to get more and more views, it will likely become the most-viewed trailer ever in the said Star Cinema channel on Youtube. Hahahaha..mas magaling si ryzza mae kay ksyza vice...keep up the good work aleng maliit..
bat parang one sided ang report na ito? everytime na i try ko ang icheck result ng kinita, laging high lights ang kay kay vice.... at kunting info lang ang kina ryzza... hhhaaiizzztt ganito ba ba talaga to to? X Factor Israel winner is Pinay Rose Fostanes!